This photo reminded me that there was once a time on Danforth East when women and men were genteel and did things like drink tea in the afternoon, prune rosebushes and eat dinner together as a family (sans television). Life was simpler, and a jar of peaches in the winter would have been a delicacy the whole family would savour. In our fast paced world of iPhone gizmos, instant access to goods and take-out food 24/7, we buy jars of Del Monte fruit in air-conditioned supermarkets - even in the middle of summer. Although some of these things are cool, the simple art of canning fruit and vegetables has been lost. But fear not, the East Toronto Climate Action Group is hosting a canning workshop right in the 'hood, on Monday night at the Danforth Mennonite Church at 2174 Danforth Avenue at 7:30 p.m. The fruit of choice: Peaches, Pears and Blueberries. SO.....head on over to the East Lynn Farmers' Market tonight and get some of the freshest peaches you can (they're perfectly in season today!) and sign up for this workshop on Monday. You can RSVP to Mary-Margaret McMahon at 416-693-9276 spargy@rogers.com. You will thank me in January!! P.S. 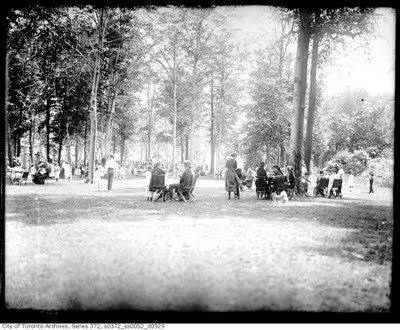 The photo is of Monarch Park, June 1921. Courtesy of the Toronto Archives. Just wanted to say I love your blog. We moved to Danforth East last year and your blog has helped us discover all the hidden treasures in the neighbourhood! Just wondering if you're on twitter. It would be great to receive a tweet when you've updated your blog so we know to check out the latest post. Or even just a good tool to share mini-posts. Let me know if you have a profile we can follow. Thanks add! I'm so happy you're discovering things via my blog. I love that I have readers. I am indeed on Twitter - @sarah_kiriliuk is my handle. Glad to add you as a follower!